Electric shavers today come with manuals that can rival a short novel to describe all of the features and technology that are packed into the small devices. But just over 80 years ago the electric shaver was invented to be a simple machine designed to make shaving easier and safer. To see just how far electric shavers have come we are going to take a look at the history of the electric shaver and some of the innovations that have made it into a daily appliance that millions of men and women use each day. In 1930, a Canadian Army Colonel, Jacob Schick, filed the first patent for an electric shaver. Schick believed that shaving could be improved over the wet shave process that was common during the early 20th century and designed an electric shaver which could provide a dry shave removing the need for shaving cream or brushes. For the next two decades, Schick continued to improve the dry electric shaver, selling millions of units and legitimizing the market for the electric shaver. In 1937 Remington, known for everything from firearms to typewriters, entered the electric shaver market. Remington’s first shaver added an innovation known as a foil shaver which puts a cover over the razors themselves to provide a more comfortable shave experience. Over 75 years later many of the best selling electric shavers continue to use foils to provide a close shave and comfortable shave. Philips was looking for new markets to expand into when they began their development on an electric shaver in the late 1930s. 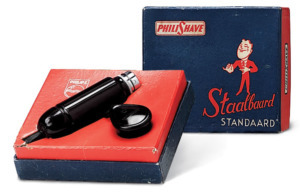 In 1946, Philips released their initial shaver into the market, the Philishave, which used a rotary shaving system instead of foils or razors vibrating back and forth. This new system allowed the electric shaver to be smaller in size and was better at shaving around the contours of the face. In 1947, Philips renamed their electric shaver to Philips Norelco and continues to sell their shavers under the Norelco brand today. Over the next 20 years Philips continued to improve their shaver, first with increasing the number of shaving heads from one to two, and in 1966 released the three head shaver design which lives on in current Norelco shavers today. In 1951, Braun released their first electric shaver focusing on foil shavers and functional design. Braun’s first major success was the Braun sixtant released in 1962. This model sold over 10 million shavers and established Braun as a leader in the electric shaver market. After this success Gillette, a pioneer in safety razors, acquired Braun in 1967. Throughout the first 30 years of the electric shaver, users had to ensure they were close to an outlet whenever they wanted to shave. 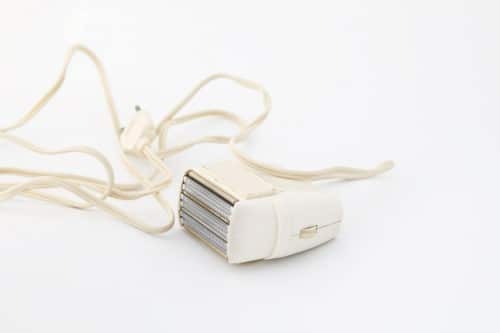 In the 1960s shavers began to become available with rechargeable batteries to allow users to shaver wherever they may be. 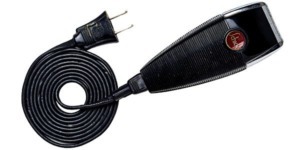 While original batteries suffered from short battery life, removing the need to manage the cord while shaving made the experience much closer to what users were looking for. In the 1990s and early 2000s, manufacturers were able to add lithium ion batteries to dramatically increase battery life. Today, nearly all electric shavers on the market feature rechargeable batteries that allow shaving for up to an hour per charge. Historically combining water with electric appliances was a recipe for disaster. Today many electric shaver models can operate in both wet and dry environments. This innovation gives shavers the freedom to choose whichever method provides the most comfort during their shave. Early models of electric shavers were difficult to maneuver around facial features. Their bulky design prevented users from easily shaving all areas of the face and caused frustration when stray hairs were difficult to shave. Both rotary shavers and foil shavers have added pivot points to their shaving heads to ensure they easily contour to the many angles the face has. Top of the line rotary shaver models often feature heads that can pivot in different directions at the same time. Manufacturers have begun adding self-cleaning charging stands to their top of the line products. These stands are designed to ensure the blades remain clean and lubricated for each shave.